I absolutely loved Literary Wonderlands which explored imaginary worlds we know from fiction – you can read my review here. 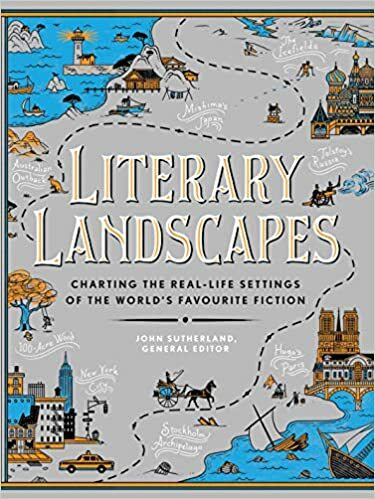 So I was really excited to find there was to be another book in a similar vein, Literary Landscapes, which explores the real life settings of some of the most popular works of fiction. Just for fun, I have a little quiz for you but there is also the opportunity to win a copy of the book – details of the competition below. First of all, a Literary Landscapes Quiz. Pop your answers in the comments box and I’ll let you know if you were correct or not. I’ll post all the correct answers in the comments tomorrow. Which novelist is associated strongly with the Anglo-Saxon word “Wessex”? Which twentieth century novelist, the author of 12 novels including one of the most scandalous of its time, was inspired by his own Nottinghamshire background? The map in which book features ‘The Hundred Aker Wood’, ‘To the North Pole’, ‘Where the Woozle wasn’t’ and the ‘Pooh trap for Heffalumps’? The Welsh seaside town of Laugharne was transformed into where in Dylan Thomas’ “Play for Voices”? The Cobb at Lyme Regis is associated with which novel? Which Tim Winton novel recalls the experiences of two families, the Lambs and the Pickles, living in a shared house? Carlos Ruiz Zafόn’s The Shadow of the Wind was published in 2004, sold over 25 million copies and was published in over 40 countries. The 1940s of which Spanish city does it explore? Which novel by Eleanor Catton won the Booker Prize and celebrates the New Zealand gold rush of 1866? Some stories couldn’t happen just anywhere or any time – often the scenery , landscape or era is as central to the tale as any character – and just as easily recognised. What adventures would Heidi have had without her mountain neighbours? Would Jim Hawkins have experienced such an adventure had he not lived in mid – 1700s England? Literary Landscapes brings together an eclectic collage of over 50 familiar literary worlds paired with original maps and archive material, as well as illustrations and photography. In this collection of essays the reader will follow Leopold Bloom’s footsteps around Dublin, become immersed in Les Misérable’s revolutionary Paris, feel the chill wind of Emily Brontë’s Wuthering Heights, and hear the churning paddles of Mississippi steamboats in Mark Twain’s Huckleberry Finn. The landscapes of enduring fictional characters and literary legends are vividly brought to life, evoking all the sights and sounds of the original works. For anyone who ever dreamt of escaping the everyday, Literary Landscapes will transport you to the greatest places in literature. Absolutely loved this post! The quiz is an excellent idea too. I have been given a different answer for 5 but yours may be more accurate. Well done! An alternative answer for number six would be The French Lieutenant’s Woman.